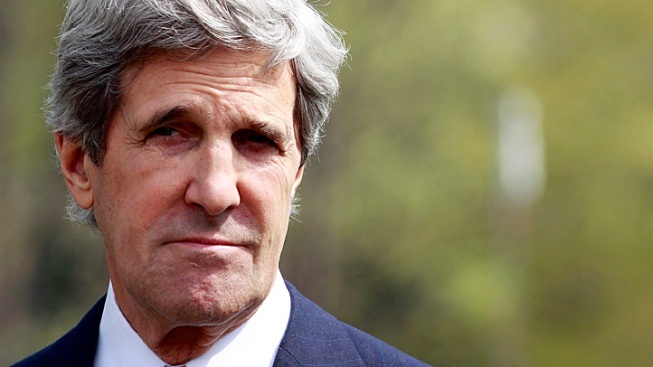 Sen. John Kerry, D-Mass. has been nominated for Secretary of State. Thank you very, very much. I am in awe of the wonderful comments that were just made and I appreciate them and I'll say a little bit more about them. Before I begin, I would like to have the privilege of just introducing very quickly, I think most of you know my wonderful wife Teresa, who has been a part of this great journey for a long time, my brother Cam who is serving over in the Commerce Department as counsel there. I trust they know he's here and have given him time off, and my daughter Vanessa and her husband Brian, both of whom are working as physicians at Mass General in Boston, and another daughter who's not here, Alexandra, and three stepsons who likewise are spread around the world. We are thinking about them as we embark on this wonderful journey. I am enormously grateful for the generous comments of the Chair and the ranking member. Thank you very, very much. Thank you also for your tremendous cooperation over the course of the last years, and providing that you get me out of here quickly, I will be able to congratulate you more fully when you officially assume your responsibilities. I will tell all of you on this committee, the new members particularly, that I have enjoyed Chairing this committee and working with you as much as anything I have done, or been privileged to do in my career. I think this is one of the great committees of the United States Senate and it is the only major committee that I have served on since day one when I arrived here in the Senate in 1985. As you know, the Committee carries special consequential responsibilities for the security of our nation and I thank each and every one of you for the serious consideration that you give and have given to the challenging issues and for the remarkable cooperation that I have had as Chairman of the Committee. If confirmed, I look forward to continuing to work particularly closely with all of you as we tackle some of the toughest issues and challenges that I have seen in the entire time that I have served on this committee. And I particularly welcome the new members in that regard. I am very grateful to President Obama for nominating me and entrusting me with this important responsibility, and I am particularly grateful to Secretary Clinton, Senator McCain and Senator Warren for their introductions they made just now. I will not take it personally that this may be the one item in Washington that seems to unite Democrats and Republicans to get me out of the Senate quickly. Secretary Clinton particularly has served above and beyond the call of duty; I think everyone on this Committee would agree. Her service has been superb and we all thank her for a job well done and for her tireless efforts on behalf of the nation. She has set a very high mark for her stewardship of the State Department and her commitment to country and I can pledge to you, with the consent of the Senate, I will do everything in my power, summon every energy and all of my focus to build on her record and the President's vision. Senator McCain, as he mentioned, is a longtime friend. We met here in the Senate coming from very different positions and perspectives but you know we found common ground. I will never forget standing with him in Hanoi, in the cell in the Hanoi Hilton in which he spent a number of years of his life, just the two of us, listening to him talk about that experience. I will always be grateful for his partnership in helping to make real peace with Vietnam by establishing the most significant process in the history of our country, or in any country, for the accounting for missing and dead in any war, and then working to lift the embargo and ultimately normalizing relations with an old enemy. John had every reason to hate but he didn't. Instead, we were able to help heal deep wounds and end a war that divided too many people for much too long. And as we talk about war and peace and foreign policy, I want us all to keep in our minds as I think we do the extraordinary men and women in uniform who are on the front lines even as we meet here today, the troops at war who help protect America. I can pledge to you that as a veteran of war, I will always carry the consequences of our decisions in my mind and be grateful that we have such extraordinary people to back us up. I also thank my new colleague, Senator Warren, for her generous comments. She is a long time, fierce fighter for what is just and fair and if her testimony has an effect today and helps win votes for my confirmation, she will become the Senior Senator of our state in a record few legislative days! I spent 29 years. It is humbling to appear before you in this new role as President Obama's nominee for Secretary of State. But my approach to this role, if confirmed, is also deeply informed by the 28 plus years that I have been privileged to spend in the Senate. That perspective will remain with me if confirmed as Secretary, and I'm already excited by the many ways that we can work together and we must work together to advance America's security interests in a complicated and ever more dangerous world. I would add that I'm particularly aware that in many ways the greatest challenge to America's foreign policy will be in your hands, not mine - because while it's often said that we can't be strong at home if we're not strong in the world, in these days of fiscal crisis, and as a recovering member of the Super Committee, I am especially cognizant of the fact that we can't be strong in the world unless we are strong at home - and the first priority of business which will affect my credibility as a diplomat and our credibility as a nation as we work to help other countries create order, the first priority will be whether America at last puts its own fiscal house in order. I really can't emphasize enough how imperative this is. People all over the world are looking to the United States for leadership. We are known as the indispensable nation for good reason. No nation has more opportunity to advance the cause of democracy and no nation is as committed to the cause of human rights as we are. But to protect our nation and make good on our promises, as well as to live up to our ideals and meet the crisis of this moment, it is urgent that we show people in the rest of the world that we can get our business done in an effective and timely way. It is difficult enough to solve some of the problems that we face, but I will tell you it becomes impossible or near impossible if we ourselves replace our credibility and leverage with gridlock and dysfunction. I have heard it in my trips and Secretary Clinton has heard it in her trips, and any of you who travel who will begin to hear questions about whether or not the United States can or will deliver. More than ever, foreign policy is economic policy. The world is competing for resources and global markets. Every day that goes by where America is uncertain about engaging in that arena, or unwilling to put our best foot forward and win, unwilling to demonstrate our resolve to lead, is a day in which we weaken our nation itself. My plea is that we can summon across party lines, without partisan diversions, an economic patriotism which recognizes that American strength and prospects abroad, depend on American strength and results at home. It is hard to tell the leadership of a number of countries that they have to deal with the IMF, balance their budget, and create economic order where there is none if we don't provide it for ourselves. It is also imperative that in implementing President Obama's vision for the world as he ends more than a decade of war, that we join together to augment our message to the world. President Obama and every one of us here knows that American foreign policy is not defined by drones and deployments alone. We cannot allow the extraordinary good that we do to save and change lives to be eclipsed entirely by the role that we have had to play since September 11th, a role that was thrust upon us. American foreign policy is also defined by food security and energy security, humanitarian assistance, the fight against disease and the push for development, as much as it is by any single counter terrorism initiative - and it must be. It is defined by leadership on life threatening issues like climate change, or fighting to lift up millions of lives by promoting freedom and democracy from Africa to the Americas or speaking out for the prisoners of gulags in North Korea or millions of refugees and displaced persons or victims of human trafficking. It is defined by keeping faith with all that our troops have sacrificed to secure for Afghanistan. America lives up to her values when we give voice to the voiceless. I share with the President the conviction it is equally imperative we assert a new role in a world of increasing failed and failing states. Burgeoning populations of young people, hungry for jobs, opportunity, individual rights and freedom are rebelling against years of disenfranchisement and humiliation. A fruit vendor in Tunisia who ignited the Arab awakening wanted dignity and respect. He wanted to sell his fruit without corruption and abuse. That's what led him to self-immolate. The youth of Tahrir Square who brought Egypt its revolution represented a generational thirst for opportunity and individual participatory rights of governance - not a religious movement. The developed world can do more to meet the challenge and responsibility of these aspirations. With the help of all the members of this Committee, I am determined to help President Obama meet this moment. It is vital for our nation that we do so. The world is well aware we face a number of immediate, dangerous challenges, particularly in the Middle East and South and Central Asia. Given our extraordinary interest in non-proliferation, we must resolve the questions surrounding Iran's nuclear program. The President has made it definitive--we will do what we must do to prevent Iran from obtaining a nuclear weapon and I repeat here today: our policy is not containment, it is prevention and the clock is ticking on our efforts to secure responsible compliance. This Administration, working with Congress and an unprecedented international coalition, has put into place crippling sanctions on Iran. Mr. Chairman, you have been a leader in that effort and I know will continue to be. President Obama has stated again and again, and I want to emphasize this, he and I prefer a diplomatic resolution to this challenge, and I will work to give diplomacy every effort to succeed. But no one should mistake our resolve to reduce the nuclear threat. Nearly 42 years ago Chairman Fulbright first gave me the opportunity to testify before this committee during a difficult and divided time for our country. Today I can't help but recognize that the world itself then was in many ways simpler, divided as it was along bi-polar, Cold War antagonisms. Today's world is more complicated than anything we have experienced - from the emergence of China, to the Arab Awakening; inextricably linked economic, health, environmental and demographic issues, proliferation, poverty, pandemic disease, refugees, conflict ongoing in Afghanistan, entire populations and faiths struggling with the demands of modernity, and the accelerating pace of technological innovation invading all of that, shifting power from nation-states to individuals. With the end of the Cold War, Henry Kissinger pointed out in his superb book "Diplomacy": He said, "None of the most important countries which must build a new world order have had any experience with the multistate system that is emerging. Never before has a new world order had to be assembled from so many different perceptions, or on so global a scale. Nor has any previous order had to combine the attributes of the historic balance-of-power system with global democratic opinion and the exploding technology of the contemporary period." That was written in 1994 and it may be even more relevant today. So this really is a time for American leadership, a time for fresh thinking, a time to cross party lines that divide and come together in the interest of our nation, a time to find ways to work together to maximize the impact of all America's resources, including the great resource of this committee and of the United States Senate. If I am confirmed, one of the first things that I intend to do is to sit down with Senator Menendez and Senator Corker and invite all the members of the Committee to come together, hopefully at a time where there is no interruption and we can actually really dig in and talk, and talk about how we can have a constructive dialogue and a collegial relationship because even as we pride ourselves on the separation of powers and the unique oversight role the Committee plays, the challenges in the world are so enormous that we would do our country a disservice if we did not identify the ways that we can help each other to confront a unique set of questions globally. If you confirm me, I would take office as Secretary proud that the Senate is in my blood - but equally proud that so too is the Foreign Service. My father's work under Presidents, both Democratic and Republican, took me and my siblings around the world for a personal journey that brought home the sacrifices and the commitment the men and women of the foreign service make every day on behalf of America. I wish everyone in the country could see and understand first-hand the devotion, loyalty and amazingly hard, and often dangerous work that the diplomats on the front lines do for our nation. Theirs is a service which earns our country an enormous return on investment. I will be proud and honored to represent them and I will work hard to augment our public diplomacy so that the story is told at home and abroad. Everyone on this committee knows well that the road ahead is tough. But I believe just as deeply that global leadership is a strategic imperative for America, it is not a favor we do for other countries. It amplifies our voice, it extends our reach. It is the key to jobs, the fulcrum of our influence, and it matters - it really matters to the daily lives of Americans. It matters that we get this moment right for America and it matters that we get it right for the world. One discussion that I particularly look forward to beginning with you, my colleagues, and with our country, is about the commitment that we make in our foreign affairs budget - less than one percent of the entire budget of government, at a time that the world is getting smaller and our economy depends on its relationship with every other country in the world, that we face a more global market than at any time in our history. So not just in my briefings at the State Department but in my conversations with business leaders, in my trips to crisis areas, war zones and refugee camps in some of the poorest countries on earth, I have been reminded of the importance of the work that our State Department does to protect and advance America's interests and do the job of diplomacy in a dangerous world and particularly I think there is more that can be done to advance our economic capacity and interests. In this debate, and in every endeavor, I pledge to work very closely with this committee, Mr. Chairman and Mr. Ranking Member - not just because it will be my responsibility, but because I will not be able to do this job effectively, nor will our country get what it needs to out of these initiatives, without your involvement and ideas going forward. So thank you, Mr. Chairman and members of the Committee.